Colorado Essentials for Childhood is a partnership of stakeholders who are committed to a future where children and families thrive in the places where they live, learn, work and play. Our ultimate goal is to prevent and reduce child abuse and neglect in our state. 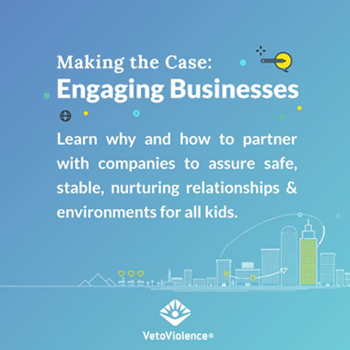 Making the Case: Engaging Businesses is a new CDC resource that explains how you and your community can work with the business sector to assure safe, stable, nurturing relationships and environments for all children and families. Get steps to build relationships with your business community. You can create and sustain strategic partnerships to stop child abuse and neglect before they start and ensure a healthy and productive workforce. The Essentials for Childhood Family-Friendly Employment workgroup is a terrific example of this CDC resource "in action". Find out more at www.familyfriendlycolorado.com. informative post! I really like and appreciate your work, thank you for sharing such a useful facts and information about strategic business partner model strategies, keep updating the blog, hear i prefer some more information about jobs for your career hr jobs in hyderabad . Thank you very much for this great post. I like and appreciate your work, thank you for sharing. Very thank for the info. I hope to read it again. Thank you Queader for this post! Now I have to use and thank you more. Yes, my friend, I think I'm a good story for me and many others. Where else could I get that type of info written in such an ideal way? I have a project that I’m just now working on, and I have been on the look out for such information. I enjoy the efforts you have put in this, regards for all the great content . Check out all these great resources for employers! Requires a two-generation approach, targeting resources to children, as well as mothers, fathers and caregivers at the same time. is the responsibility of all sectors in the community, including the business sector and policy makers. Requires that resources and opportunities be seamlessly integrated from conception to career. Requires changing social norms to value families, support and empower mothers and fathers, and honor the strengths found in different cultures. Begins with the inclusion of the family voice in decision making.